A typical in-orbit problem is a transfer from the geostationary transfer orbit (GTO) to the geostationary orbit (GEO). One possibility to do so is the use of a low-thrust electric propulsion system. In this case the transfer lasts up to several months but the fuel mass consumption is just a small part of what would be needed with chemical propulsion. During the low-thrust transfer the spacecraft is spiraling from the GTO to the final GEO in dozens or even hundreds of revolutions. In fact, this makes the trajectory optimization problem a challenge with hundreds of thousands of optimizable parameters. A software that can handle this kind of problems is the sparse optimal control software SOCS from The Boeing Company. 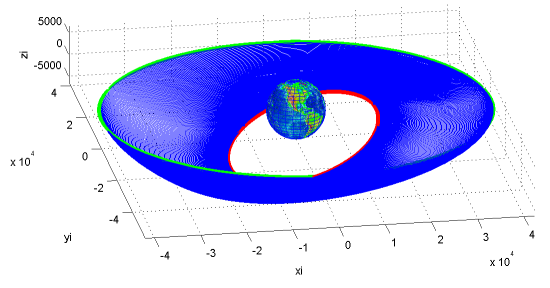 Another in-orbit application is the analysis of the influence of gravity field uncertainties to operational orbits. Uncertainties of the gravity field model can not be neglected, especially in case of long-term missions in low altitude orbits like the German Moon mission LEO. Possible close proximity operations at small asteroids are orbiting in a photo-gravitational orbit, hovering, flyovers and landings. Services we provide include general feasibility, delta-v and reference trajectories.